Secretary-General Ban Ki-moon (left) addresses Security Council meeting chaired by Foreign Minister Hina Rabbani Khar of Pakistan. Secretary-General Ban Ki-moon today called for a focus on conditions that feed terrorism as part of a comprehensive strategy against the scourge, as he opened a debate in the Security Council that expected some 50 speakers, including several high-level national officials. “Terrorism festers where conflicts are endemic … and where human rights, human dignity and human life are not protected and impunity prevails,” Mr. Ban said in a meeting chaired by Foreign Minister Hina Rabbani Khar of Pakistan, which holds the January Presidency of the 15-member body. Making it clear that no grievances can ever justify terrorism, the Secretary-General underlined the connection between security and development, the need for dialogue and understanding and the importance of information technology in countering messages of hate and radicalization. Mr. Ban said that the past year saw solid progress in international solidarity against terrorism, noting that in June the General Assembly reaffirmed the United Nations Global Counter-Terrorism Strategy, strengthening resolve to support victims of attacks and renewing commitments to a comprehensive approach to terrorism grounded in respect for human rights and the rule of law. He also welcomed upcoming international conferences on human-rights training for counter-terrorist officials, national and regional strategies against terrorism and addressing conditions conducive to the spread of terrorism. Other counter-terrorism priorities included ending the financing of the scourge and ensuring that the crimes did not impede delivery of humanitarian assistance to civilians, particularly in Mali and the broader Sahel region, “where terrorism feeds off of extreme destitution and undermines development through violence, intolerance and human rights abuses,” he said. Expressing sympathies with “the far too many victims” of the past year, he paid particular tribute to Malala Yousufzai, the Pakistani teen who was targeted by extremists because of her educational advocacy. The Foreign Minister called for international efforts against terrorism to be much more nimble in adapting to the ever-changing tactics of terrorists, to address root causes such as intolerance and long-festering conflicts, to focus on organized crime and regional initiatives and boost cooperation for capacity-building and intelligence-sharing, among other areas, while avoiding associating extremism with any religion or culture. “An honest dialogue between different religions and civilizations is a continuing political imperative,” she said. 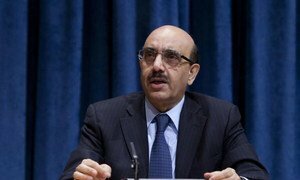 United Nations peacekeeping and tackling terrorism, issues which are particularly relevant for Pakistan, as well as for the wider international community, will feature prominently in the work of the Security Council in January, the 15-member body’s president said today.